Today I took a not-your-average rafting trip on the Shubenacadie River about an hour outside of Halifax, Nova Scotia. What makes it special is the river’s tidal bore. The Shubenacadie flows from the Minas Basin on Bay of Fundy where the tides are the highest in the world. A tidal bore is a wave created by an advancing tide. Nowhere else in the world will you find a tidal bore as large as what you experience on Shubenacadie! The river was shallow with lots of sandbars so Henry took his time navigating us to the part where we would experience the roller coaster rapids that the bore creates. Enroute we saw bald eagles waiting and Henry pointed out a massive eagle nest which looked about the size of our little boat. He took us up river a piece and then told us to watch downstream for a wave. Suddenly there she was, a wave like you would see rolling into a beach. Within minutes the water was a churning mess of choppy waves. Telling us to hang on tight and lean in, Henry began to ride into the six foot waves. They came one after another with deep swells in between. Water poured over us and filled our little boat but she stayed afloat, emptying as fast as she filled. Apparently she’s the only type of craft that can handle the tidal bore, which is why all the rafting companies on the river use them. The size or height of a tidal bore varies according to the phases of the moon. We were day 2 following a new moon. Full moon dates are when you get the biggest tidal bore and waves can reach heights of 18 feet or more. Even with full rain gear, expect to get wet! I wore my bathing suit under my rain gear, which was a good decision. Showers and change rooms were available so I could slip into my street clothes once we were done. 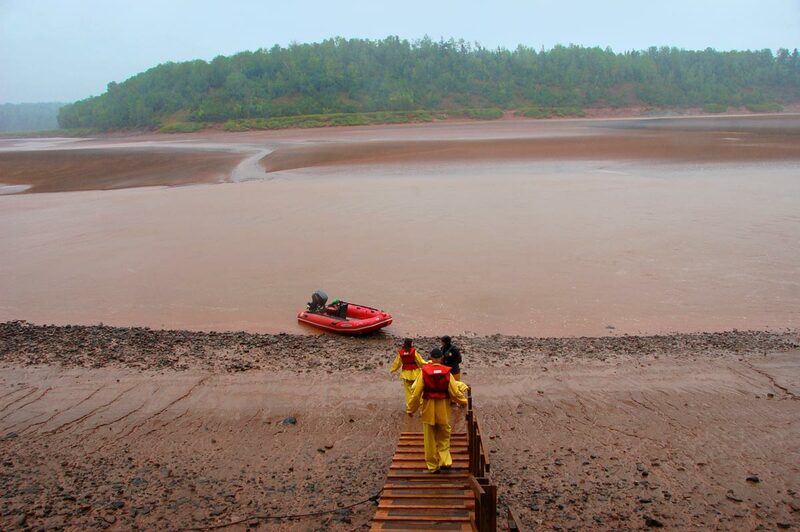 Tidal Bore Rafting Park also offers what they call ‘Mud Otter Tours’ or mud sliding on the river without the waves or rapids. Overnight accommodation is also available. Where’s the picture of you getting in the zodiac?